10. Two tickets and a chance to win California's Mega Millions jackpot. Someone's gotta win! 9. A McChicken sandwich and fries from McDonald's. I was going to say a McDouble and fries but I had never heard of it. 8. About three-quarters (give or take) of a tank of gas. 7. One of those packaged sandwiches from the vending machine at work. Sometimes that's all you have time for. 6. Half a hot dog from the ballpark. Well, you can't really buy a half of a hot dog but I think you know what I mean. 5. A half-gallon of milk. At least according to the ad I got in the mail this week. 4. A fish taco from Rubio's. It's a San Diego thing. 2. Two items from the dollar store. From toothpaste to detergent to USB cords, that place has everything. 1. This 1964 Topps baseball card of Harmon Killebrew. Remember when you would open up a wax pack and there would either be a piece of gum stuck to a card or gum residue caked on the card's surface? Well, there must have been a case of gum next to this card. It's a mess! If I didn't know any better, I would wonder if it were mold growing on the card. But since I've had the card a while now and it hasn't grown any fuzz, I think it's old gum residue. Come to think of it – it could be orange juice. Maybe it's the dripping of an ice cream or the remnants of a Snickers bar. For about a year and a half now, I've posted pieces of my baseball card collection. I posted a T206 Walter Johnson with burn marks. I posted a T206 Johnny Evers that was supposedly damaged in Hurricane Katrina. Then there was the 1957 Topps Duke Snider that was practically torn in half and the 1971 Thurman Munson that was graded 5 of 100. 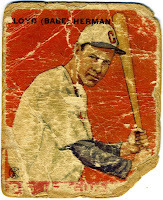 But as far as poor old baseball cards go, this 1933 Goudey Babe Herman may be the best (worst) of them all. I cannot begin to describe this card's flaws. Let's just say being run over by a truck would be a bit flattering. As a kid growing up in the 1970s, a new box of Frosted Flakes in the morning also meant a surprise — a baseball card. This beauty from 1976 has long lost its 3-D effect, but it still has super-bright color. A nice substitute for the Topps set. It was sets like Kellogg's and Hostess that brought variety to my baseball card world. Those were the choices back then. No Upper Deck, Fleer, Donruss – or any of the other number of sets available beginning in the mid-1980s. One thing I remember about these cards it that they had a tendency to curl. I've heard it referred to as the "Kellogg's Curl." The other thing I remember is that I would never get great players like Yastrzemski in my box of cereal. For some reason I remember getting the likes of Burt Hooten. About two years ago I had a chance to buy a 1933 Goudey Lou Gehrig. I forget the asking price but it was less than I thought and I remember thinking to myself: "I can do this." So up until a few days ago I was Gehrig-free. Then I saw this card on eBay. Sure it's not from his playing days but it's a sweet card. It really is. I think the 1961 Fleer set is underrated and definitely under-appreciated. It's simple design is really classic. And if you are looking for a card of Lou Gehrig or Babe Ruth or Ty Cobb or Honus Wagner you may want to consider the 1961 Fleer set. Plus, you won't have to take out a loan from your local bank to get it. I wonder what it was like for a kid in 1961 to pull a Lou Gehrig from the pack. Did anyone ever utter the words, "I'll trade you my Babe Ruth for your Lou Gehrig and Mel Ott?" Anyone out there remember collecting this set? I'd like to hear from you. This cards is downright cool. 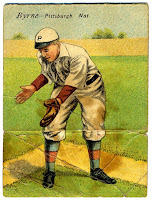 Distributed in packs of cigarettes in 1911, this issue includes two players. The full panel is of Hall of Famer Fred Clarke. Clarke was a player/manager for four Pittsburgh pennants. He was also a teammate of Honus Wagner. On the other side of the card is Robert Byrne, Clarke's third baseman. When you fold the card in half, Byrne's body overlaps Clarke's and the combination of Byrne's top and Clarke's bottom produces its own image. No, this is not an early look at the 2010 Upper Deck baseball card design. In fact, this is Topps' solution to the Braves moving from Milwaukee to Atlanta. It appears that Topps didn't have a photo of Mathews in an Atlanta hat so they decided to just airbrush the old "M" off his cap. When I first saw this card I thought a kid took an eraser to it. But as I looked closer I realized that Topps did the erasing for him. It's too bad because it looks ridiculous. I would rather have had him in the Milwaukee cap. I think that if I were a kid in 1966 I would have been able to figure it out. At the very least this card gives us an idea of how difficult it will be for Upper Deck to make cards of major leaguers without using team logos. Since the company lost its license to use the logos yesterday, it will have to get awfully creative in its design to satisfy today's baseball card buyer. I'll trade you this poor old baseball card for yours. Do you have a baseball card that has been run over by a truck? How about chewed up by the dog? Maybe it was used to start up the grill or dropped in the pool? Here's your chance to get rid of that old card you are embarrassed to own. You know, the one you were going to just toss because it was never going to be worth anything. If you want to trade for this 1975 Topps Reggie Jackson, please comment on this link with your offer and e-mail a photo of the card to pooroldbaseballcards@gmail.com. I'll choose the best deal and if and when the trade is completed I will blog about the transaction and post the new (old) card. It doesn't have to be a Hall-of-Famer but it does have to be a poor old baseball card. 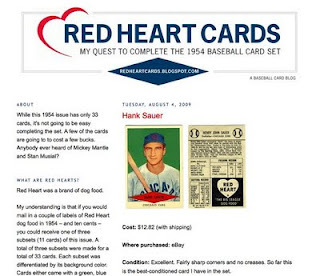 So as many of you may know, I am trying to complete the 1954 Red Heart set. You can follow my progress at redheartcards.com. It's a few weeks shy of a year since I posted my first Red Heart on the site. And with only 33 total cards I figured I would have finished the set off in less than a year. I was able to get the two tough cards out of the way fairly quickly. The Mickey Mantle and Stan Musial were not cheap. I didn't expect them to be. So now all I had to do was find the easy ones, right? Wrong. They're not so easy to find after all. Especially at a reasonable price. I purchase four new cards over the weekend and now have 21 of the cards in hand. I'm getting there, only 12 more to go.